Living in rural Ontario surrounded by trees and snow one winter, the idea of blending the crisp, cool colourlessness of cast glass with the dark, heaviness of burnt wood was born. Each table is made from using a locally sourced, reclaimed barn timber. We pour molten glass onto the end grain, creating a texture on the cast glass. The glass is then high polished, the wood is burnt to a blackened patina and then finished with oil and wax to seal in the colour. This series was inspired by a drive through our Canadian Rockies. A marriage of glass and wood, ice and vast landscape between mountains. 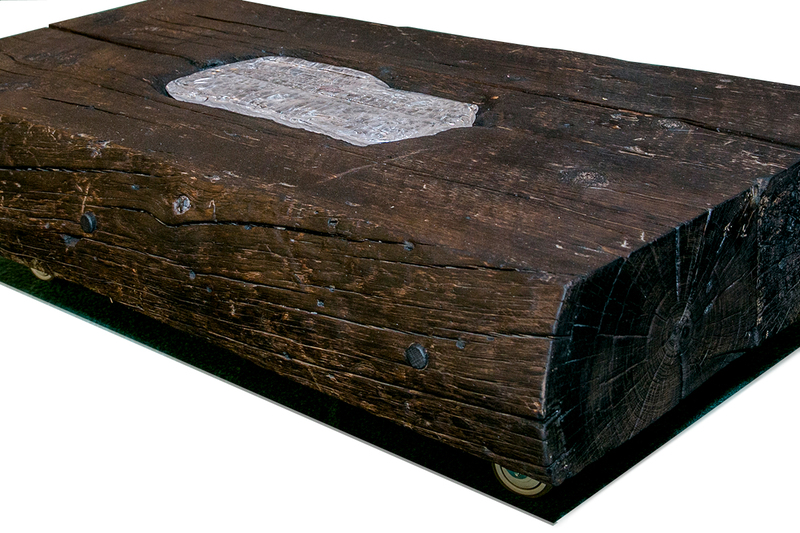 Each coffee table is made from using a locally sourced, reclaimed barn timber. We pour molten glass onto the surface creating ‘puddles’ that capture the texture on the cast glass. The glass is then high polished. The wood is burnt to a blackened patina and then finished with oil and wax to seal in the colour. Inspired by the ice floes in Newfoundland, the glass fills the voids and creates a river of clear glass, contrasted against the blackened patina of the burnt wood. Each table is made from using a locally sourced, reclaimed barn timber. 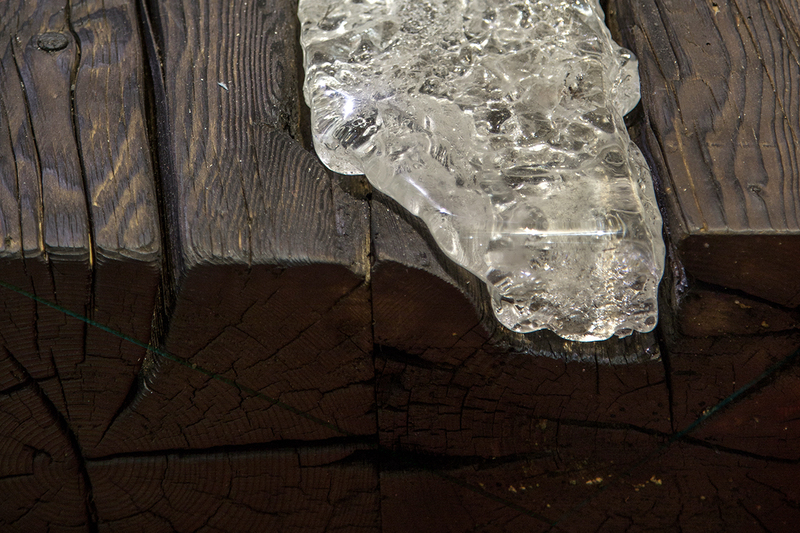 We pour molten glass into the spaces of the wood created from age and missing wood. It is then finished with oil and wax to seal in the colour. Merging the old and the new to create custom lighting for your home. Each light is one of a kind, using antique pulleys and handblown glass globes, available in 3 styles. The beam light uses reclaimed barn timbers that are burnt to a blackened patina and then finished with oil to seal in the colour. Available in Pulley with 2 lights or Beam with 3 lights. Custom orders welcome. Jenn Wanless-Craig and Terry Craig combine their love for travel and nature to create work that is inspired by glacial and geological landforms. Elements of design merge with rich materials to create beautiful modern work.